K. S. Chitra malayalam singer profile and biography is given here. K.S. Chitra is a renowned playback singer who has sung songs in multiple languages. She had her formal training in Carnatic music under the able tutelage of Dr. K. Omanakutty. In her lifetime, she has got many awards at both national and state levels. Please go through the life and work of this great artist. K.S. Chitra is a famous film playback singer from Kerala. To her credit, she has sung in many prominent Indian languages. For over three decades, she has sung in different genres of music such as Indian classical, devotional, popular, light and cinematic music. In all, she has sung over 20,000 songs in different languages. The nightingale of Kerala has won the National Award for the music six times in the past. Understandingly, Chitra is the only female singer in the whole country to bag the national awards that many times. Apart from six National Awards, she has won five Filmfare awards and 31 different state awards. She is also an only South Indian singer to have won state awards from all the South Indian states. Because of these feats, she is fondly called as Chinna Kuyil or Keralathinte Vanambadi. K.S. Chitra was born on July 27, 1963, into a Thiruvananthapuram-based family of Musicians. Initially, she was tutored in music by her father Late Krishnan Nair. She has a sibling. Her name is K.S. Beena. She is also a playback singer, just like her illustrious younger sister. After noticing the innate musical abilities in young Chitra, her father nurtured her by providing the rightful training in music. Later in her life, K.S. Chitra received extensive training in Carnatic music from Dr. K. Omanakutty Amma. After getting the initial foundation in music, she continued her study in the field of music at the University of Kerala Music department. As a result of this devout training, she passed her Master's degree in Music with flying colors. In fact for a period of 6 years from 1978 to 1984, she received the National Talent Search Scholarship from the Central Government. Before her first venture in playback singing, she got married to Vijayashankar who is an engineer by profession and an established businessman. In their marriage, they had one child. Her name was Nandana. The young child Nandana died in a freak accident when she fell into a pool in Dubai. K.S. Chitra got her initial break in Malayalam film industry as a playback singer when the Music Director M.G. Radhakrishnan invited her to sing a song for a film. From that point in time, she never looked back, and she kept really getting singing opportunities in different Malayalam films. Slowly, she became a regular playback singer in all Malayalam film songs. After the success of her songs in her initial film, K.S. Chitra was called by then existing Music Directors to sing songs for them. Thus, she got opportunities to sing songs for films such as Snehapurvam Meera, Attahasam, and Njaan Ekanaanu. Simultaneously, during that period, she began to accompany K.J. Yesudas in his music concerts. This accompaniment enabled her to gain reputation as a quality singer in worldwide platform. After her success in Yesudas-dotted music concerts, K.S. Chitra was noticed by the senior Music Directors like Jerry Amaldev, Shyam, Mohan Sithara, Raveendran, Johnson, and Kannur Rajan. With their help, she slowly climbed the success ladder to accomplish the stature of a popular playback singer. K.S. Chitra got her first break in Tamil film industry, when she was called by Ilaiyaraaja to sing a song for a film Neethana Antha Kuyil. This opportunity was materialized for her because of her singing performance in Nokkethadhoorathu Kannum Nattu. The ace Music Director Ilaiyaraaja got so impressed by her song voice quality that he decided to offer her a chance to sing a song for the film Neethana Antha Kuyil. Later on, Chitra got another offer to sing songs for a Tamil remake of Nokkathadhoorathu Kannum Nattu, an ace film directed by Fazil. For the stellar singing performance in the song Chinna Kuyil Paadum in the film Poove Poochudava, she got the pet name Chinna Kuyil (Little Nightingale). By 1980s, Chitra's reputation as a playback singer grew several folds. By that period, she became an indispensable feature for almost all melodious songs that were rendered. Thus, the nightingale of Kerala began to sing songs for the most famous composers in Malayalam. Simultaneously, she began to sing songs for Ilaiyaraaja in Tamil, Kannada and Telugu languages. After hearing a few songs of K. S. Chitra, even the Academy Award winning A. R. Rahman also offered her chances to sing songs for his films also. Chitra's music association with A.R. Rahman became so popular that the director gave her more singing opportunities in his films. When she was climbing the success ladder in playback singing, K.S. Chitra never antagonized the older stalwarts in film music. Thus, she sang for almost all music directors of the older generation. She sang for veteran composers such as M.B. Srinivas, K.V. Mahadevan, S.P. Venkatesh, G. Devarajan, V. Dakshinamoorthy, M.S. Viswanathan, M.M. Keeravani, Bharadhwaj, Deva, Vidhyasagar, etc. As she became a popular playback singer in South India, the ace directors in Bollywood began to take notice of her singing ability. Hence, she ventured into the field of Bollywood playback singing as well. Till date, she has recorded songs for reputed Music Directors in Bollywood such as Anand-Milind, Anu Malik, A.R. Rahman, Laxmikant-Pyarelal, Rajesh Roshan, R.D. Burman, Viru Shah, Naushad Ali, etc. After her success in film playback singing, Chitra's voice was liked by the general public. She sang for her first album Raaga Raaga way back in 1993. A song sung by her in a music album directed by Usthad Sultan Khan was rated as Gold in the year 2000. The album in which K.S. Chitra has sung the gold-rated song was Piya Basanthi. In another album titled Sunset Point, she sang 8 songs written, conceived and narrated by the reputed Hindi lyricist Gulzar. K. S. Chitra also has released a collection of Bhajans and Kirtis in memory of the legend Classical Vocalist M.S. Subalakshmi. This collection was titled as My Tribute. Other albums released by her in Hindi include A Salute to Lataji and a Ghazal album. Apart from these, she has also released albums based on the works of K.J. Yesudas, M. Jayachandran and Sharreth. To help the film artists of yesteryears who have fallen wayward in the rapidly changing world of Indian Cinema, K.S. Chitra has established a fundraising organization. In this noble work, she was helped by a reputed Malayalam channel by the name Asianet Cable Vision (ACV). The name of the organization is Sneha Nandana. This fund-raising organization was formed on the occasion of Chitra completing thirty years of playback singing. This organization was officially launched at a function called Chitra Pournami in the year 2011. In this grand event, many people from the world of cinema participated and hailed the noble cause behind it. In recognition of the contributions made by K.S. Chitra in the world of film music, she was conferred with the honorary doctorate by the Sathyabhama University in Tamil Nadu. In a span of 30 years, she has been conferred with many awards and citations. These awards can be classified broadly in National Film Awards, State Film Awards, Filmfare South Awards and Channel Music Awards. National Film Awards: On six occasions, K.S. Chitra has bagged National Film Awards. Of these, three in Tamil language, two Malayalam language and the remaining one in Hindi language. State Film Awards: In the state of Kerala, she has received the state awards 15 times spanning a period of 20 years. In Tamil Nadu state, she has received the state awards five times. For her contribution to Telugu film industry, she was given the state award 9 times. In Kannada state, she has received the state awards three times. For her singing in Oriya, she received the Orissa state award once. Channel Film Awards: K.S. Chitra has bagged Asianet Film Awards 7 times, Mathrubhumi Film Awards 7 times and Mirchi Music Awards South 4 times. She has received the Star Screen Award and Bollywood Movie Awards also. K.S. Chitra is a reputed playback singer from Kerala. 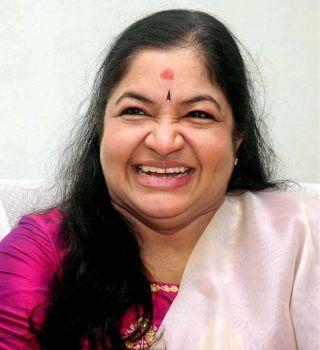 She has been in the field of playback singing for over 30 years. In this span of time, she has sung in many prominent languages of the country. Till date, she has sung over 20,000 songs. During this period, she has sung songs for every known music composer in the country. After getting popularity as a singer, she even ventured into the field of private album making. The albums such as My Tribute, A Salute to Lataji, etc. have become popular in the market. She has also started a philanthropic organization to raise funds to help financially the musicians and other artists of yesteryears.